Technology is neither good nor bad, nor is it neutral. This is a lesson taught by Plato and repeated by Neil Postman. The French sociologist Jacques Ellul makes the same point and so does historian of science Melvin Kranzberg. Postman elaborated on the formative power of technology in Technopoly: The Surrender of Culture to Technology (1992). Here’s one of his summary statements. [O]nce a technology is admitted, it plays out its hand; it does what it is designed to do. Our task is to understand what that design is—that is to say, when we admit a new technology to the culture, we must do so with our eyes wide open. It is against the backdrop of this broader discussion that James K. A. Smith wrestles with the impact of Facebook and Twitter in Imagining the Kingdom: How Worship Works. [B]oth Facebook and Twitter can seem to foster habits of self-display that closely resemble the vice of vainglory. Or at the very least, they amplify … self-consciousness and ironic distance … to a debilitating degree. Indeed, I do not envy our four teenagers in the least: far from carefree, their adolescence is a tangled web of angst that is, I think, qualitatively different from that of past generations. The difference, I suggest, stems from a unique constellation of cultural habits that has exacerbated their self-consciousness to an almost paralyzing degree. Granted, self-consciousness is part of the rite of passage that is adolescence. The hormonal effects on teenaged bodies make them realize that they are bodies in ways that surprise them. They inhabit their bodies as foreign guests, constantly imagining that all eyes are upon them as they go to sharpen their pencil or climb the stairs at a football game. Such self-consciousness has always bred its own warped ontology in which the teenager is the center of the universe, praying both that no one will notice and that everyone will. The advent of social media has amplified this exponentially. In the past, there would have been spaces where adolescents could escape from these games, most notably in the home. Whatever teenagers might have thought of their parents, they certainly didn’t have to put on a show for them. The home was a space to let down your guard, freed from the perpetual gaze of your peers. You could almost forget yourself. You could at least forget how gawky and pimpled and weird you were, freed from the competition that characterizes teenagedom. While it purports to be simply a “medium,” it comes loaded with a Story about what matters, and who matters. And as we inhabit these virtual worlds—clicking our way around the environment, constantly updating our “status” and checking on others, fixated on our feed, documenting our “likes” for others to see—we are slowly and covertly incorporated into a body politic with its own vision of human flourishing: shallow connections for instant self-gratification and self-congratulation. And all of this happens precisely because we don’t think about it. James K.A. Smith teaches philosophy and theology at Calvin College in Grand Rapids, Michigan. 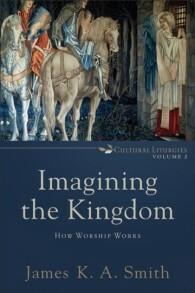 He is the author of numerous books, including Desiring the Kingdom: Worship, Worldview, and Cultural Formation and Imagining the Kingdom: How Worship Works. Neil Postman’s Technopoly: The Surrender of Culture to Technology is available here.